Embark on a memorable journey when you board Air China's non-stop flight to Beijing. En route, cross the International Dateline and lose one day. Flight Detail: SFO to Beijing is 12 hours non-stop. Arriving at Beijing Capital International Airport Terminal 3 at 5:55 pm local time. You will be greeted by our experienced tour guide(s) outside the customs and they will transfer you to your hotel. On the way to the hotel, your guide(s) will briefly introduce themselves to you and provide you with some important information regarding your trip. The first day of your journey begins with a wake-up call arranged by the tour guide. Enjoy a delectable American breakfast buffet before starting your day. A deluxe motor coach and your devoted tour guide(s) are ready for your memorable trip. Your first peek into the capital city of Beijing begins with a tour to the world's largest and renowned public square where many historical events once took place - Tiananmen Square. Around the vast square, you can see The Great Hall of People, holding the congress of the Communist Party and National People's Congress, History Museum, Military Museum and Monuments to the People's heroes. When available, you can visit Mao's Mausoleum, where his body is in a crystal coffin. Under the famous Mao's portrait, which is positioned at the center of "The Gate of Heavenly Peace" entrance, you will walk into the Forbidden City (also known as Imperial Palace), which holds 9,999 rooms. Experience the intricate architecture and exquisitely designed layout of these grand buildings once housed by Chinese Emperors who ruled during the period of the Qing and Ming Dynasties for almost 500 years (1420-1911). Thereafter, you will partake in a tranquil visit to the picturesque landscape of the Summer Palace with historic temples, numerous pavilions, marble boat and famous 728-yard Long Corridor, situated on the man-made Kunming Lake. You will then wrap up the evening with a delicious Peking Duck Dinner at one of the most prestigious restaurants in Beijing recognized for its specialty. Today you will begin the morning by setting out to the Juyongguan section of the Great Wall of China, also considered as one of the greatest wonders of the world. This massive wall stretches well over 4,000 miles and once was used as the soldiers' safeguard to protect the Chinese empire's northern boarders against invaders. You then have the opportunity to climb up the mammoth sized wall at your own pace. Be sure to take in the experience and enjoy the breath-taking view from the top of one of the greatest achievements of civilization. After lunch, you will tour the exterior portion of the Beijing National Stadium, also familiar to the world as the Bird's Nest and the home to the 2008 Summer Olympics. The stadium designed by an architecture firm in Switzerland implemented the world's largest structure built of steel. Later, you will capture the lifestyles of families residing within the Historic Hutong by rickshaw. The amazing gray brick courtyard residence is Beijing's oldest and remains infused with timeless culture and history. In the mid-1990's, most of the original Hutongs vanished rapidly and was substituted by high-rise buildings and commercial offices. Today you have a scheduled trip to Urumqi, widely known as "beautiful pasture" and also a major industrial center and the capital of Xinjiang Uygar Autonomous Region. Xinjiang is a large (comparable in size to Iran), sparsely populated area. There, you will not only observe Islamic culture of Uygar people and daily lifestyle of many other ethnic groups but also vast natural scenery and the Gobi Desert. Prior to your next visit to the city of Turpan, you will spend your last hours in Urumqi by touring the Xinjiang Autonomous Region Museum. The museum is worth a visit as the place hold interesting and rare visual exhibits highlighting the lifestyle of the minority groups of Xinjiang. Marvel at the exhibits and the local arts of the city. Then you will have a bus ride to Turpan, also known as Oasis in the Gobi Desert. You will be brought to the Jiaohe Ruins where the remains of ancient Chinese ruins are found along with ancient monastery and a palace. The Jiaohe Ruins is also a marked historical highlight recorded in the UNESCO World Heritage Site. Turpan, prevalent of grape orchards and fields of grains is considered the hottest place in China and has a record of having more than 100 summer days annually. The scorching weather tends to be beneficial for the growth of most of the city's fruits widely known as the "Hometown of Grapes" and an important producer of tasteful wine. In the evening you will be invited to see an exotic Uygar singing and dancing show. Today's excursion entails a full day of visits to several main attractions. In the morning you will visit the Bezeklik Thousand Buddha Caves located in the legendary Flaming Mountain, where Monkey King was badly burned when he tried to extinguish the flame by using a false fan borrowed from Fan Princess. On the premises, there are 77 artificial caves and inside each cave is a mural of the Buddha painted on the ceiling along with hundreds of Buddhist sculptures and figures protected over hundreds of years. Thereafter, you'll visit the western front of the Flaming Mountain, where the Grape Valley lies. There are acres upon acres of sweet and delectable grapes that exist here. Next, awaits the Karez Underground Irrigation Channels, a 2,000-year-old system that its main function is to deliver water from nearby snow-capped mountains to Turpan and its agricultural fields. Prior to an overnight train that will transport you to the next destination of Dunhuang you will have the chance to visit the local Uygar People's Family home to witness the daily lifestyle of the Muslims in Turpan. Transportation Detail: Overnight Train Approximate travel time of 7 1/2 hours. There are soft sleeping compartments on the overnight train with 4 berths per compartment. The guide in China will be the one to assign a berth to each passenger. You may request to share a compartment with another person/couple on the tour, but you cannot pay extra to have one compartment per couple or to oneself. Also be sure to have an overnight bag in your carry-on because your check-in bag will be in cargo. Upon arrival, you will tour the Crescent Moon Lake in the Singing Sands Dunes. From a distance, make sure to keep your ears peeled for the whistling tunes among the sand dunes. The sounds are created by the winds cascading in a downward direction of the sand dunes at a low frequency mostly during dry and hot weather conditions. If you are feeling adventurous, take up on an optional camel ride. An entertaining Cultural Performance awaits you in the evening. Please note the cultural performance is subject to availability. Today is primarily devoted to tour the Mogao Grottos, also widely referred to as the "Caves of the Thousand Buddhas." The cave that attracts swarms of tourists contains the most impressive and well-preserved examples of ancient Buddhist cave art aging over 1,000 years. The treasure house contains hundreds of sandstone caves holding more than 2,000 statues and 45,000 brilliantly bright paintings of Buddha and Chinese mythological figures. After breakfast, you will visit Jiayuguan Fort, the western end of the Great Wall. At the base of Jiayu Mountains, situates the legendary Jiayuguan Pass, known as the most strategic point along the ancient Silk Road. The whole fortress was built in 1372 during the Ming Dynasty and is encompassed by magnificently designed towers that exude landscape views from every direction. You will also have an opportunity to visit the First Beacon Tower, which was used as a warning signal against enemies during the 11th century. Followed by a visit to the Overhanging Great Wall that was built as an extension to the Jiayuguan Pass as an integral part of the ancient defense system. After lunch, fly to the next captivating and history-filled city of Xi'an. Xi'an was the ancient capital for 11 dynasties and east end of the Silk Road. It was the world's most open and prosperous ancient international metropolitan with over a million before Beijing became the political and economic center of China. It has been also considered a favorite to tourists for experiencing and understanding of this amazing city with its glorious past and splendid progress of today. Make sure to get some rest and relaxation and prepare for the next day's adventure. Today you will be given ample time to tour the exhibit of the historical Terracotta Warriors belonging to the era when the infamous Emperor Qing Shihuang reigned. It was in 1974 when a farmer who was merely digging for water came across one of the biggest discoveries of the world which led to the massive excavation of an army of over 7,000 life-size Terracotta Warriors and horses molded by clay. Explore the vast sea of clay warriors in all three vaults. For the next 5 years, visitors will not only see the existing warriors and horses but might get lucky to witness some of the greatest new discoveries while the archeologists are digging the vaults in front of you. Thereafter, you will visit the well-preserved emblem of Xi'an, the Wild Goose Pagoda. The towering 211.6 feet high structure completely made of bricks originated during the Tang Dynasty when Emperor Gaozong once reigned. The day will conclude with a tasteful and creatively prepared Dumpling Feast followed by an exquisite traditional Tang Dynasty Music and Dance Show. The rest of the evening is yours to enjoy! After breakfast, take a city tour. After lunch, you will fly to Wuhan. Flight Detail: Approximate flight time via Air China is 2 hours. After breakfast, visit the Hubei Provincial Museum where a large collection of artifacts are displayed from the Zenghouyi Tomb, which was unearthed in 1978 on the outskirts of Suzhou. En route to Yichang, enjoy a Bronze Bell Performance after lunch. After dinner, pre-board the MV Century Sky or Gold Cruise 6, an ultra luxurious 5+ star cruise ship. All cabins are outside with a private balcony. In the morning, depart from Yichang and set sail into Xiling Gorge (the longest at 41 miles). Then take a land excursion to the Three Gorges Dam Site. It is the world's largest dam, 1.7 miles long and 220 feet high, and the largest electricity-generating plant of any kind. The dam body was completed in 2006. All of the originally planned components of the project were completed on October 30, 2008. The project produces hydroelectricity, increases the river's navigation capacity, and reduces the potential for floods downstream by providing flood storage space. From completion until September 2009, the dam has generated 348.4 TWh of electricity, covering more than one third of its project cost. There were over 1.2 million people who immigrated to other parts of the country in order to complete the project. In the afternoon, sail through the five-step ship lock. There will be a Captain's Welcoming Dinner and evening entertainment. After breakfast, sail through Wu Gorge, which is 25 miles long and well known for its 12 forest-covered peaks and quiet beauty with ever-changing scenery. In the afternoon, experience a once in a lifetime adventure when you transfer to a small riverboat and cruise up the Lesser Three Gorges. Then sail through Qutang Gorge, the shortest (5 miles), narrowest (500 feet) and most dramatic one. After breakfast, disembark in Chongqing, the world's largest city by population of about 30 million and the largest by area of 32,000 Square miles, the picturesque "Mountain City," previously known as China's wartime capital during the Second World War. Before flying to the capital of Tibet, Lhasa, marked as the "City of Sunshine" and also known as the highest city in the world,You will visit the Huguang Guild Hall, originally built in 1759 during the Qing Dynasty, used for people to pray for good harvest. It has now been renovated into a museum including temple, hall rooms, and opera stages; featuring local handcrafts, and performing arts. After lunch, fly to Lhasa. Lhasa, over 12,000 feet in elevation, is predominantly home to the Tibetans and the Hans. En route to your hotel, visit a local Tibetan school to catch a glimpse of what the students daily life is like and for a photo opportunity. The remainder of the day is for relaxing and acclimatizing to the altitude. This morning, you will be visiting the famous Potala Palace, past residence of the revered Dalai Lama. King Songstan Gambo constructed the famed World Heritage Site in the 17th century. Gambo, founder of the Tibetan empire, was well known for his heroic movements and as a result became a nationally worshiped figure by the Tibetans. The current 13-story building today is converted into a museum, which comprise of over 200,000 statues, temples, shrines, and historical Tibetan materials and articles. In the afternoon, visit the Drepung Monastery, which is the original home to monks before the Potala Palace. Enjoy the murals and the harmonious colors displayed on the building and prepare for a sweet serenade from the Tibetan musicians while feasting on the local cuisines. Today you will take a 70-mile scenic drive along Lhasa River and cross Tsangpo River (highest river in the world) to visit Yamdrok Yumtso, meaning Jade Lake. You will reach the highest altitude of your life at Khampa La Pass, 15,668 feet above sea level. You can see here the highest hydroelectric plant on the planet. You will enjoy the stunning beauty of the blue lake reflecting white clouds and snow-capped mountains; typical Tibetan shepherd villages and hot springs on this mystic plateau. You will have a picnic lunch here. After returning to Lhasa, you will visit the 1,300-year-old Jokhang Temple, declared as an UNESCO World Heritage Site in 2000. Built in 647, the temple has been a prime location considered sacred and holy to the Tibetans who have worshiped here. You will also find that in the temple sits the famous Sakyamuni Statue, believed to have been a key figure in Buddhism. You will take a flight to Chengdu, the capital of the Sichuan Province and nicknamed the "Land of Milk and Honey." Chengdu is widely known as the city where the strong tradition of tea drinking still resonates. 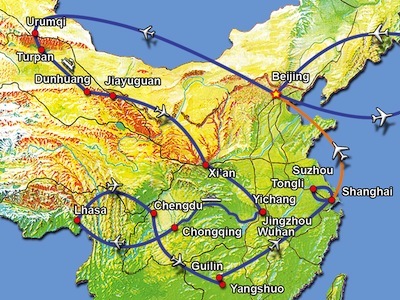 Some city attractions will be included upon arrival in Chengdu. Flight Detail: Flight from Lhasa to Chengdu is approximately 2 hours. What would a trip to China be without a visit to see those adorable pandas? Tour the Panda Research Institute and Breeding Center (there are 102 pandas currently) to watch these lovable and charismatic creatures live their lives. You will get a glimpse of the pandas during feeding hours and see them indulge in their favorite past time- sleeping. People have the opportunity to take pictures sitting with the pandas or even holding the baby pandas at additional cost. You will keep these pictures as life-long memories. Then you will be transferred to the airport and take a flight scheduled for Guilin. Be prepared for a city recognized for its stunning landscapes and captivating lifestyles of the people who call this enchanting place "home." Tourists will regret missing the chance to soak in Guilin's most amazing beauty. Guilin is a must see! Guilin is said to be "the best scenery under heaven" for its unique limestone karsts creating the picturesque of the location. This city of surreal beauty is prevalent of aromatic Osmanthus trees and is famous for its hills along the Li River. You will embark on a memorable 3-hour Li River Cruise passing through the scenic landscape of Yangshuo. As the whimsical cruise docks, you will then hop on a trolley that will transport you to your hotel. Take a glimpse of the lush agriculture that surrounds you. The remainder of the day is free to explore on your own. If you are willing and ready to exit the door of your hotel, you will find yourself immersed in a market full of vendors anxiously waiting for you from all directions. Test you bargaining skills and have fun! There is also the option to rent a bicycle or a tuk-tuk to go around the countryside and get an up close and personal look at the hills of Yangshuo and the life of the Chinese residing in this city. Depending on the weather conditions, you will have the choice to partake in an evening show directed by the famous Zhang Yimou who designed the opening and closing ceremonies of the 2008 Beijing Olympics. Optional Tour Disclosure: The "Lui San Jie" evening show (aka The Impression Show) will not run if the weather does not permit. If the performance is available, the cost is US$40/person. The Impression Show is choreographed by Zhang Yimou who designed the opening and closing ceremonies of the 2008 Beijing Olympics. A deluxe motor coach will take you to Guilin. Enjoy a visit to the Reed Flute Cave. Pay attention to the music the vendors are making as they blow their flutes constructed from the actual reeds that grow outside the cave. Enjoy the radiating lights that illuminate the natural rock formation and stone pillars along the zigzag pathway within the cave. A Special Tea Banquet will be arranged if you have 10 or more people. After lunch, you will take a brief tour of the famous Guilin Tea Research Institute. It was once the royal tea garden for the Ming Dynasty known for it's high quality and health benefits. You will witness a demonstration of traditional tea manufacturing techniques done by hand. This evening, a flight to Shanghai awaits you as the day comes to a magical end. You will first begin the day with a visit to the world renowned Shanghai Bund. Take a glimpse into Shanghai's architecture and see how it looked centuries ago. This landmark known for its district neo-classic architecture of 52 European style buildings not only lined the Huangpu River but at one time in the past housed most financial institutions including national banks that were considered part of the "Big Four." After lunch, you will then tour the Oriental Pearl TV Tower, Shanghai Municipal History Wax Museum and visit the emporium-lined Nanjing Road. After attending a mesmerizing Shanghai Acrobatic Show, you will conclude the night with a visit to Xin Tian Di, which is one of the hottest new entertainment districts in Shanghai. You will have a unique opportunity to experience both Chinese and Western culture all in one place. The locals say the best time to visit Xin Tian Di is in the evening, whether you want to dance, eat, shop or simply relax and enjoy a cup of coffee. What a better way to top off the night. You will travel by motor coach to a city nicknamed the "Venice of the Orient." Indulge in the magnificent waterside architecture along with gorgeous gardens prevalent in Suzhou. Enjoy a boat ride on the Grand Canal. Notice the crisscrossing canals and watch the daily traditional lifestyle of the locals who live in this graceful wonderland. Upon arrival, you will visit the Master of the Nets Garden, the smallest and most proportional of all the beautiful gardens in Suzhou. Shortly after, you will be taken to the original Silk Spinning Factory, where you will learn the true art form of silk production. On the way back to Shanghai, you will have a short visit to a water town by the name of Tongli. Enjoy the mirror image resembling Venice, Italy which is surrounded by astonishing traditional architecture and 49 exquisitely designed bridges. Today is a free day to explore the vibrant culture and lifestyle of Shanghai. Indulge yourself by shopping at the stores along Nanjing Road, which is the main shopping street of Shanghai and one of the world's busiest shopping streets. If you're interested in more sightseeing, then visit the Jade Buddha Temple. It is still an active temple with 70 resident monks who live and work there. Another option is the Yuyuan Garden & Bazaar, which is believed to have been built in the Ming Dynasty over 400 years ago. One of the highlights is the Exquisite Jade Rock that resembles the appearance of jade with its translucent nature and numerous holes caused by water erosion. If you're just looking for a relaxing time, stop by the famous Old Jazz Bar at Peace Hotel. It's open daily from 8pm to 2am where you can enjoy jazz music dating back to the 30's and 40's and experience specially prepared cocktails and Irish or Italian coffee. The local guide will be available to give you directions and advice if you cannot decide what to do. Whatever you choose, you will enjoy the splendors of this magnificent city! We hope you enjoyed your time in China and will be leaving this country with endless amounts of stories, memories, and captivating pictures of the entire journey. You will be transferred to the airport and experience the Maglev train at the max speed of 287 mph. Air China will take you home the same day. Flight Detail: 16-hour flight of Air China to SFO with stopover in Beijing. Your luggage will be checked through all the way from Shanghai to USA. You will arrive USA the same day.